Our first ever comprehensive supplement specifically designed for women following a vegetarian or vegan diet. For me, it's really important to fuel my body to make sure it's performing its best. That means a healthy diet, getting a good night's sleep, making sure I'm drinking enough water and taking the right supplements that my body needs. 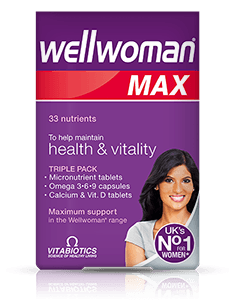 I've been incorporating Vitabiotics Wellwoman Vegan supplement into my life for a while now to help make sure I'm getting all the necessary nutrients while following a vegetarian lifestyle! 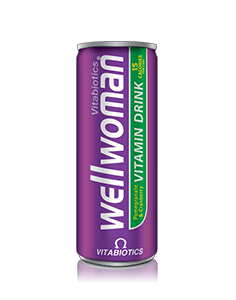 Wellwoman Vegan has been specially developed for women who are following a vegetarian or vegan diet. 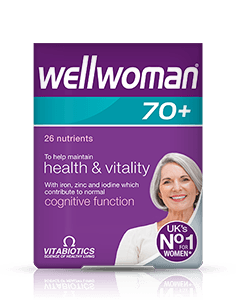 With 24 nutrients, it provides unique vegetarian and vegan support in the Wellwoman range, the UK’s No1 supplement brand for women. Wellwoman Vegan has been officially approved by both the Vegetarian Society and the Vegan Society. Wellwoman Vegan has been officially registered with the Vegan Society and the Vegetarian Society. There are a number of reasons why women following a vegetarian or vegan diet may need to safeguard their nutritional intake. Lower intake levels of zinc in the diet can be more common for vegetarians. Zinc is scientifically proven to contribute to the normal function of the immune system, as well as for the maintenance of normal skin, hair and nails. The body needs vitamin B12 to support normal red blood cell formation and to support the immune system. It’s usually found naturally in foods from animal sources, therefore a reliable supplement is often recommended if you are a vegan or vegetarian. More people are turning to vegetarian and vegan diets as a lifestyle choice, for a multitude of reasons including health benefits and moral and ethical concerns. It's estimated that around 2% of the UK population is vegetarian, which is more than 1.2 million people. What’s more, at least 542,000 people in Britain are now following a vegan diet, which is a massive increase since the last estimate 10 years ago of 150,000 (Vegan Society, 2017). Women generally have higher iron requirement than men, partly on account of blood losses during the menstrual cycle. The most common source of iron is red meat, hence when following a vegetarian or vegan diet it’s important to make sure you receive enough iron from alternative sources. Iron contributes to normal formation of red blood cells and haemoglobin, an important consideration during the monthly cycle. Vitamin B12 is naturally found in animal products, including fish, meat, poultry, eggs, milk, and milk products. Vitamin B12 is generally not present in plant foods, so it’s also important to ensure you get enough. Vitamin B12 contributes to red blood cell formation. 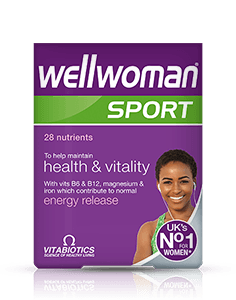 Wellwoman Vegan has been specially developed to provide higher levels of iron and vitamin B12 (when compared to Wellwoman Original). 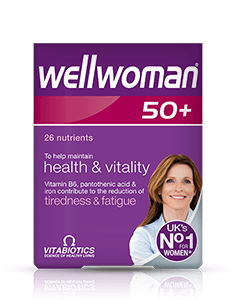 The Wellwoman Vegan formulation provides vitamin B6 which contributes to the regulation of hormonal activity. It also includes 400mcg folic acid which contributes to normal maternal tissue growth during pregnancy, which is important if you're planning a pregnancy or there's a chance you might get pregnant. Vitamin D plays an important role in the body for all round health and wellness. Vitamin D contributes to the maintenance of normal bones and teeth and the normal function of the immune system. The most common sources of vitamin D are from non-vegan sources in the form of D3. I.e. oily fish, butter and egg yolk. 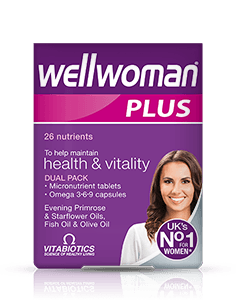 Wellwoman Vegan provides 10µg of vegetarian and vegan vitamin D2, the exact level as recommended by the UK Department of Health. Every vegan needs a reliable source of iodine in their diet. Your body uses iodine contribute to the normal production of thyroid hormones and normal thyroid function. These hormones control how fast your cells work. In the UK, the recommended iodine intake for adults is 150 micrograms per day. There is no easy way of knowing how much iodine is in plant foods. While seaweed is a rich source, the amount of iodine in a plant food varies depending on how much is in the soil the plant is grown in. 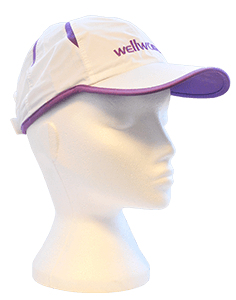 Wellwoman Vegan provides exactly 150mcg iodine. 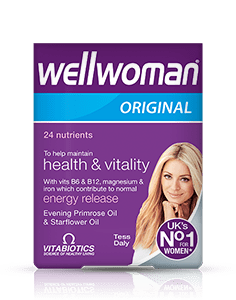 Wellwoman Vegan includes Evening Primrose and Starflower Oil in a unique powder form that allows a tablet format, eliminating the need for a capsule shell. Leading a hectic lifestyle, juggling work, family and social commitments can often leave you feeling in need of some extra support. 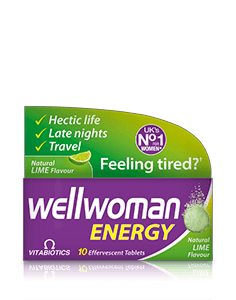 Wellwoman Vegan contains vitamin C, iron, copper and iodine which contribute to normal energy release. Iodine also contributes to normal cognitive function. The formula also provides folate which contributes to the reduction of tiredness and fatigue, helping you keep on top of your day. We all want to do the best that we can for our health and appearance. Vitabiotics knows that what you put inside your body has an enormous impact on your internal health and outer appearance. Vitamin C is a co-factor for collagen synthesis, the substance that keeps skin supple. Wellwoman Vegan provides vitamin C which contributes to normal collagen formation for the normal function of skin. The formula also includes selenium and zinc contribute to the maintenance of normal hair and nails plus iodine which contributes to normal skin. How do we define Vegetarianism and Veganism? We hear these terms being used everywhere, but do they actually mean? A vegetarian is someone who lives on a diet of non-animal based foods, with or without dairy products, honey and/or eggs. A vegetarian does not eat foods that consist of or have been produced with products consisting of or created from any part of the living or dead animal. (Vegetarian Society, 2017). A healthy and balanced vegetarian diet should be low in saturated fat and high in whole grains, fresh fruit and vegetables. It is recommended to eat at least five portions of a variety of fruit and vegetables every day. ‘Eat the rainbow’ - choose fruit and veg of different colours. Vegetarians and vegans can lack in certain nutrients, those of special focus should include protein, iron, zinc and vitamin B12. Protein has many important functions in the body and is essential for growth and maintenance. Vegetarian and vegan protein sources include nuts, beans, pulses and soya products. Zinc is needed in the body to provide support to the immune system. Some vegetarian and vegan sources of zinc include beans, whole grains, nuts and soya products. Iron is essential to the body to prevent having an iron deficiency or even anaemia. Vegetarian sources of iron can be found in dried fruit, wholegrains, soya products and most leafy dark-green vegetables. 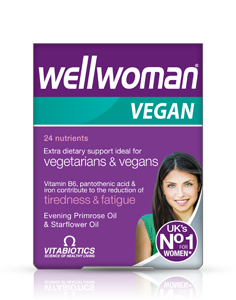 Wellwoman Vegan is available in the UK from Boots and health food stores. Alternatively to order online here. Always read the product directions before use. Do not exceed the recommended intake. As with other food supplements before using if you are pregnant, breastfeeding or suffer from food allergies, and consult your doctor or pharmacist if you have an underlying medical condition. Vitamin supplements are not intended to treat or prevent any disease. Food supplements must not replace a balanced and varied diet, and a healthy lifestyle. Do not use if you are allergic to soya. This product contains iron, which if taken in excess may be harmful to very young children.